Police have increased police patrols in the area after a video posted online showed a group of about 20 men breaking into a synagogue in the London suburb of Stamford Hill late on Saturday night. (2/2) Police made 6 arrests. Increased police patrols in #StamfordHill#N15 area to provide reassurance to the community. Scotland Yard has confirmed that the incident took place at around 1:15am at the Ahavas Torah synagogue. “We are investigating to establish the full circumstances of the incident and to identify anyone else involved in the disturbance, who has not yet been arrested,” Inspector Jonathan Waterfield, who is leading the investigation, said. According to a video posted on YouTube, attackers assaulted worshipers and vandalized the property. The mob was reportedly shouting “We will kill you,” a local witness is cited as saying by the Jerusalem Post. The attackers managed to enter the synagogue briefly, but were ejected by security staff shortly afterwards. “The disturbance began when a group of drunk males, believed to have walked to the area from a house party nearby, tried to gain access to the synagogue in Craven Park Road, N15,” said a spokesman for the Metropolitan Police Service, as cited by the London Evening Standard. A man at the synagogue, who unsuccessfully tried to stop the group from entering the building, was beaten up. He was taken to a hospital with facial injuries. “The incident is being treated as an anti-Semitic incident, due to remarks made by one of the group. However, there is nothing to suggest that it was a planned or targeted attack,” a spokesman for the Metropolitan Police Service said. The Community Security Trust (CST), a UK charity that ensures the safety of the Jewish community in Britain, tweeted they were aware of the “alleged anti-Semitic assault” and were “working with [the] police and community” on the case. 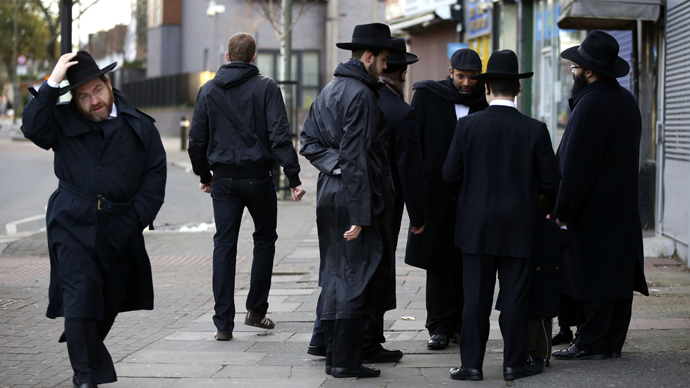 Anti-Semitism remains a major concern for Britain’s Jewish community, following terror attacks in Paris and Copenhagen earlier this year, which targeted a kosher supermarket and a synagogue respectively. The CST recorded 1,168 incidents last year, more than doubling figures for 2013. The group said the biggest increase in anti-Semitic incidents took place in July and August, during the conflict in Israel and Gaza. However, even without the sharp rise in the summer, 2014 would still have recorded an overall rise in incidents.